Earlier council resistance to a War Horse Memorial in the city’s park because of coinciding plans for an Ieper/Ypres WW1 Memorial dissipated with that garden in situ for Anzac Day 2015, although staff continued to advise other options should be considered. We walked the entire riverbank length, then met with council Community General Manager Lance Vervoort and arts advisor Nick Johnston, together with project advisors Richard Stowers (history) and Hamish Keith (arts). 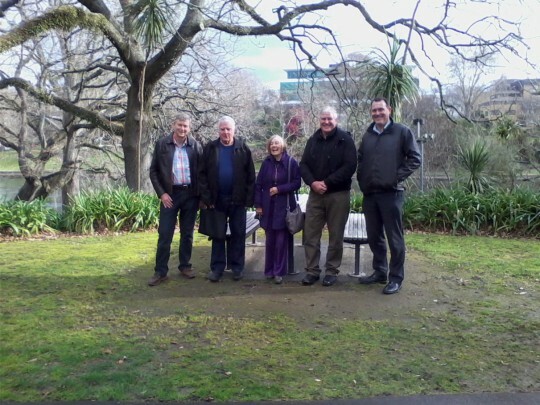 On site at Hamilton’s riverside Memorial Park – with WCEG’s Noeline Jeffries and John King, with HCC’s Lance Vervoort (far right) and project advisors Richard Stowers and Hamish Keith (far left).